An adult blue-spotted salamander, Ambystoma laterale, from Black Hawk County, Iowa. ENDANGERED. It is illegal to kill or collect this species by law in Iowa. Blue-spotted salamanders are presently known from only Blackhawk and Linn Counties. Any sightings should be reported to us or the DNR. This is a medium sized Iowa species that ranges from 4-51/2 inches in length (Conant and Collins, 1991). They have a shiny black dorsal color that may vary from dark blue-black to a lighter gray-black. They are conspicously marked with light blue flecks on the sides and tail. The speckling varies among specimens. They have four toes on the front feet and five toes on the hind feet. Costal grooves number 12. Newly transformed larvae have yellow spots that turn blue at their terrestrial lifestyle. Juvenile blue-spots are usually more intensively spotted and may have many spots on their backs. Occasionally, melanistic specimens are found. An adult blue-spotted salamander, Ambystoma laterale, from Linn County, Iowa. No subspecies are recognized, but hybrids with other species have been well documented. 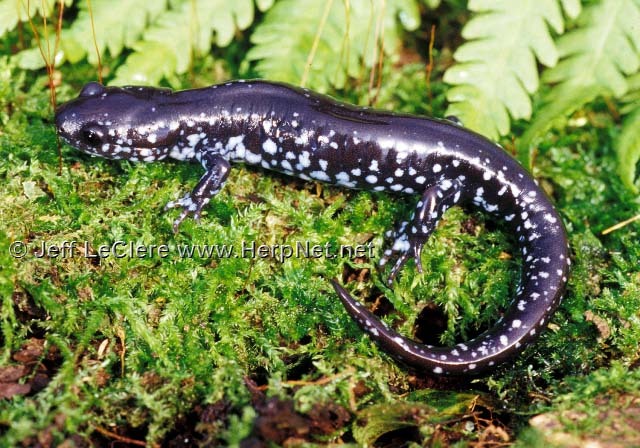 They have been known to hybridize with the Jefferson’s salamander, Ambystoma jeffersonianum, in Cass County, MN (Hall, pers com) and other states. However, specimens from Iowa have shown no such relationship (Menzel and Goellner, 1976). The blue-spotted salamander has a very restricted range in Iowa. Thus far they are only known from Black Hawk and Linn Counties. Extensive sampling has failed to locate any new populations (Camper, 1988). The blue-spot is a forest dweller. Moist soil with small ponds are important habitat elements. They are very secretive and although they do not seem to have burrowing abilities similar to tiger salamanders, Ambystoma tigrinum, (Parmelee, 1990) they effectively take shelter under fallen, rotten logs, in leaf litter, moss, and other debris providing the soil is damp. Rather sandy soil is found in both populations in Iowa. Blue-spotted salamanders were first properly recorded from Iowa in 1976, although they had been found for several years before documentation. A specimen was also taken by Witschi in 1937, but it was misidentified and not preserved well, making proper identification impossible (Menzel and Goellner, 1976). Blue-spots spend much time beneath moist cover and therefore may be inconspicuous even though they are present in large numbers. They move about during rains, but because they live in more closed woodland type habitats, they are far less taken crossing roads at this time than the tiger salamander, even from states where blue-spots are common. They are early spring breeders and can be found in ponds from late March into April. Courting consists of the male lying atop the female and rubbing his snout on her back and head. They may make quite a commotion-breaking the waters surface- from time to time. Fertilization is internal, for the male will eventually drop one to three spermatophores which the female will pick up with her cloacal lips. Eggs are laid singly or in small clusters of about a dozen attached to plants or submerged logs. The larvae grow in the pond until transformation in late summer. Of the specimens I have found from Linn County, they were most numerous at this time. Adults and juveniles overwinter under logs and rocks at the ponds edge (Vogt, 1981). Breeding is dependent upon the ponds filling with water in the spring. Recently, hydrology has been an issue with this species in Iowa. A project with a zoo in Omaha involving captive propagation of Iowa blue-spotted salamanders has been initiated, and natural Iowa populations continue to be studied each year. This salamander may slowly wave its tail back and forth when it feels threatened. A sticky foul-tasting substance is released from the back and tail. Please contact the IA DNR or us if any blue-spotted salamanders are found outside of Black Hawk or Linn County, IA. 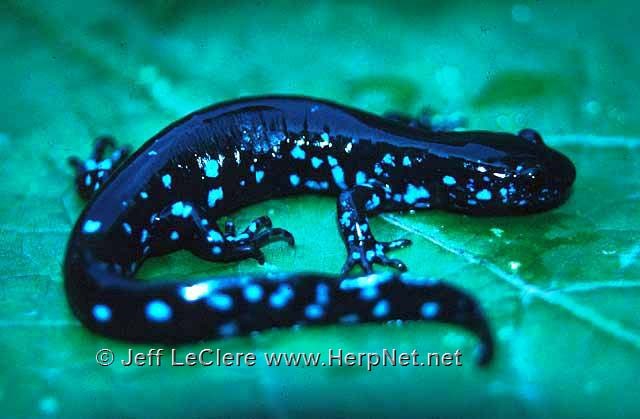 The blue-spotted salamander eats earthworms, insects of various types, spiders, snails and various other invertebrates.